cryptonaut-in-exile: Sorkin to Cameo on 30 Rock! Sorkin to Cameo on 30 Rock! Sorkin: "I want to go to there." Aaron Sorkin will appear as himself on an upcoming episode of 30 Rock. As recently as this past September, 30 Rock was still cracking jokes at the expense of Sorkin’s short-lived series Studio 60 on the Sunset Strip, about the backstage goings-on of a sketch-comedy show that launched the same month, on the same network as 30 Rock with less excellent results. 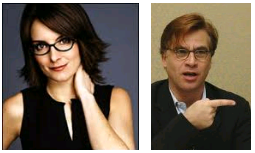 I wonder if Liz Lemon will have anything to say about Sorkin's Golden Globe acceptance speech?